Seth bringing his writing to life. We are the first chance our students have to understand why writing is important and what constitutes good writing. I had to pull out my soap box yesterday and explain to students every thing entertaining in life had to be created through writing and that writing is an art form. It was hard for them to grasp at first, but then we started brain storming some of our favorite things. Here are some of mine: my grandma’s carrot cake recipe, the song, “Love Your Love the Most” by Eric Church, Pretty Little Liars (a teen drama series that I secretly watch with my little sister), the movie Legally Blonde, and any Nicolas Sparks book (one day, I hope he write a novel based on my life). Now, I understand that not all of the items I mentioned above are published books, but some one had to write all of these works of art! Writing is more than letters on a piece of lined paper, and our students need to understand that idea. Writing should produce a feeling within the reader interacting with it. All writings should be created based on a passion to create the piece. I understand as a fourth grade teacher I can not ignite my students with a sense of gusto every time they begin to write, but my hope is one day they will write due to their own purpose or drive. This week our class studied The Indian Removal Act and Trail of Tears, definitely a piece of subject matter that should evoke some type of feeling. I told the students that we were going to write a 5 senses poem based on a person traveling on the Trail of Tears and then bring that poem to life with our IPads. We brainstormed what we would see, hear, smell, taste, and touch along the Trail of Tears and released my kids to work. Their creations were remarkable, and even some of my most reluctant writers produced eloquent poems. 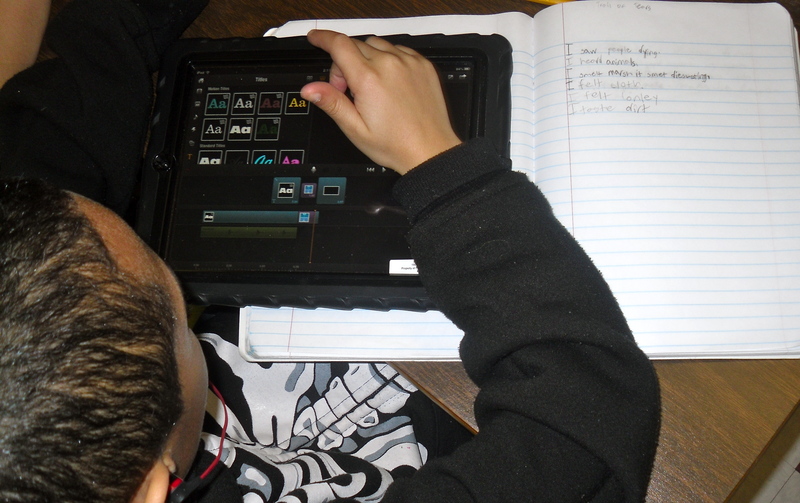 After writing the poem in their writing journal, they used the Pinnacle Studios app to add pictures and audio to their text and then read their text aloud in a video. Please see Drew’s creation below. 4-1 will most definitely be raising more writings “from the dead” soon!